Joining the growing number of Dutch language books is the 2nd Edition of Dutch for Dummies by Margreet Kwakernaak. 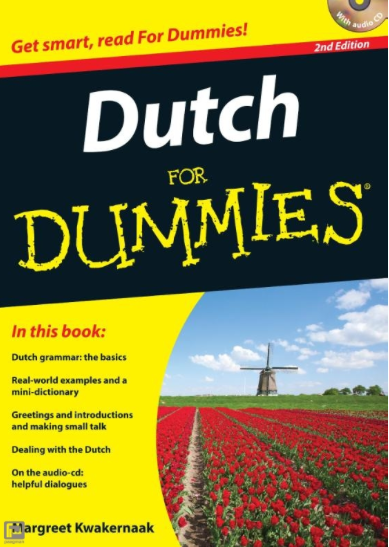 Adhering to the Dummies format, this four-part book with supplementary cd is both a Dutch language and culture guide. Part One covers the basics including ‘de’ or ‘het’, spelling rules, numbers, adjectives, propositions, past/present/perfect tense, and basic sentence construction. Language skill training is enhanced by snippets of cultural wisdom like – knowing what time you should visit your neighbors for coffee, and how many cups you will be expected to drink (p72), or how to talk about the weather (p74). The second part introduces language tools frequently utilized in activities of daily living with example conversations from the book available on the CD for listening and pronunciation practice. In addition to increasing the reader’s vocabulary, these sample discussions are opportunities to teach further grammatical skills. Part Three continues to build on the previous section by extending the scenarios to those the reader may encounter when leaving their local area. Topics such as – arranging a car rental, hotel reservations, or dealing with emergency situations are included. Finally, Part Four comprises three chapters of information and advice on fitting into Dutch society as a non-Dutch person. Some of the tips on cultural wisdom, especially those in Ch16 seem outdated, and should perhaps be taken with the proverbial grain of salt. Criticism includes complaints from some readers that the pronunciation on the CD is German rather than Dutch, and that the occasional spelling error is distracting. Overall the new Dutch for Dummies package offers a useful introduction to both the Dutch language and culture. Adopting the phrases found in specific situations presented in the book should provide the reader with confidence to continue in their efforts to master this challenging language.